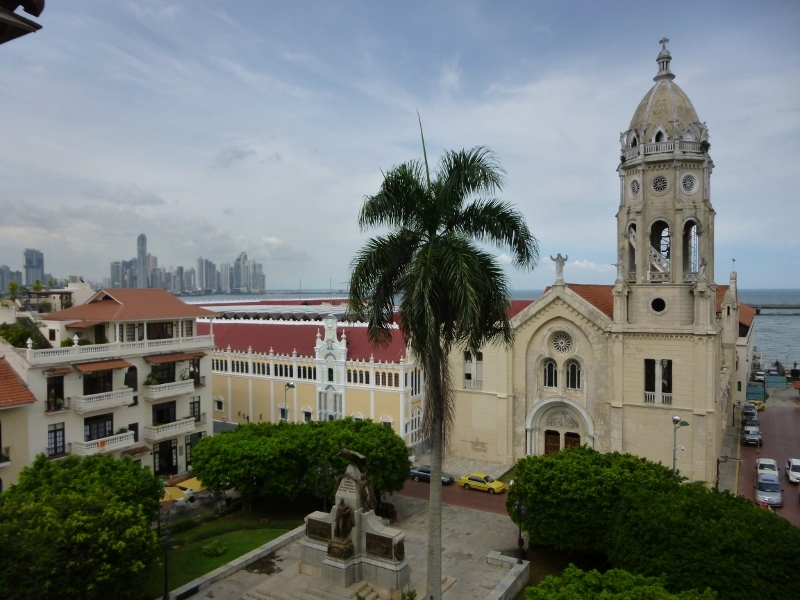 We celebrated our last few days in Central America and Panama and splurged a bit by returning to Panama City and renting a charming apartment in the tony area, Casco Viejo, with rooftop views of the city and the bay. When thinking of Panama City the first thing that comes to mind is, of course, the Panama Canal. But Panama City is far more than this modern marvel and encompasses two old and venerable cities within its boundaries: Casco Viejo and Panama Viejo. In between these two entities, each of which shares the distinction of being selected as a UNESCO World Heritage Site, contemporary Panama City carries on its robust and active life with towering skyscrapers, billboards and neon signs and three and four lanes of traffic jammed with honking, speeding cars. All of which were jarring to our senses after days spent in a tranquil, seaside village. Panama Viejo, or old Panama, is the oldest Spanish settlement on the Pacific coast of the Americas. Founded in 1519, it grew in importance as the Spanish empire expanded in South and Central America. Panama Viejo’s value to the crown was the fact that it served as the port city for most of the silver, gold, pearls and other loot that was stripped from the Andes of South America and the rain forests of Central America. From there it was moved overland, by land or water, depending on the season, to be transported to Spain. Not only did Panama Viejo flourish, it became a tempting prize for the many pirates who prowled the equatorial waters seeking lucre. Being alert to this danger the city was situated inland from the coast and fortified by a defensive wall. It was put to the torch by its Spanish rulers just prior to being overwhelmed by the notorious pirate, Henry Morgan. He was now a more respectable English admiral but still commanded a pirate army that had crossed the isthmus after razing the garrison at San Lorenzo. Panama Viejo was abandoned and fell into oblivion except for providing building materials for the new city which arose at a point roughly six miles southwest along the coast. This site, later known as Casco Viejo, was protected by fortified walls and a reef which allowed access to the city only at high tide. But the remains of Panama Viejo are magnificent and inspire an almost reverential awe as one walks among its ancient ruins. The old city’s remaining skeleton contained houses and a hospital as well as the remnants of the Cathedral with its adjacent tower which, as its medieval shape implies, probably served as a watch tower. The Iglesia de la Concepcion housed a convent for the nuns and their servants in addition to the church with its altar, sacristy and nun’s choir. The site’s location, quite near to massive, towering modern structures, offers a quick comparison of the fate of the long-ago dead in the modern era. And the city that was literally rebuilt from many of the stones of Panama Viejo? This is the rapidly changing old quarter known as Casco Viejo, the Spanish colonial city that replaced the vestiges of Panama Viejo in 1673. When the Americans’ began construction of the Panama Canal in 1904 the old town of Casco Viejo was all that existed of Panama City. However, with the completion of the canal and the natural growth of the capital city many of the country’s elite began to abandon the old quarter and it deteriorated into an urban slum. The stately homes, hotels and government office buildings fell into disrepair. But recently, a new wave of gentrification has emerged and the process of decay is being reversed and eradicated. Even now, part of the charm of the place is the grungy disrepair which stands in stark contrast to the modernized and revitalized buildings. If the trend continues, and there appears to be no reason at that this point to assume that it will not, Casco Viejo may be one of the most in-demand neighborhoods in the capital. It is filling rapidly with a mix of traditional Panamanian and gourmet restaurants serving a variety of menus aimed at satisfying every taste, chic shopping venues and large colonial buildings that are being converted to stylish condos. 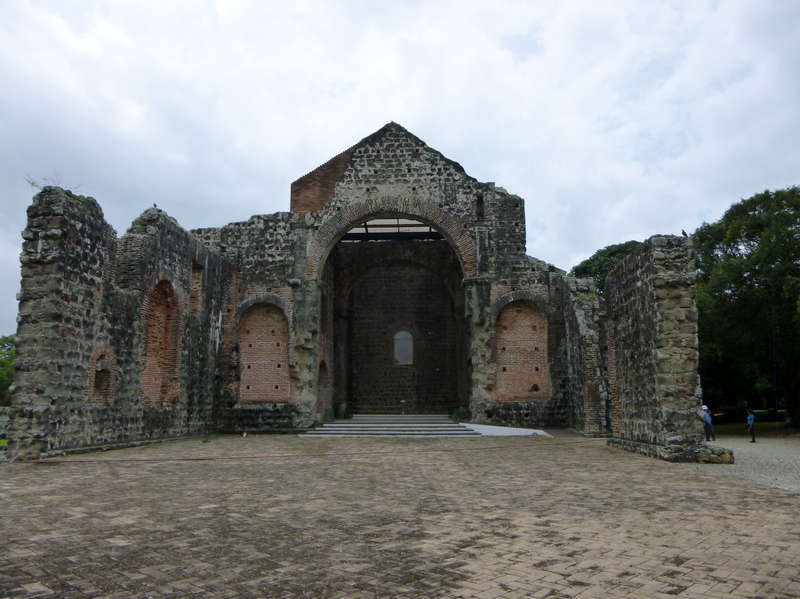 Most of the old churches remain along with many government buildings, the national theater and the original offices of the French Panama Canal organization. And so, Casco Viejo stands alongside Panama Viejo and the contemporary Panama City in a perfect trifecta and a tale of three cities. I had no idea it had such a wonderful skyline. This is definitely a place to add to our must-see list. 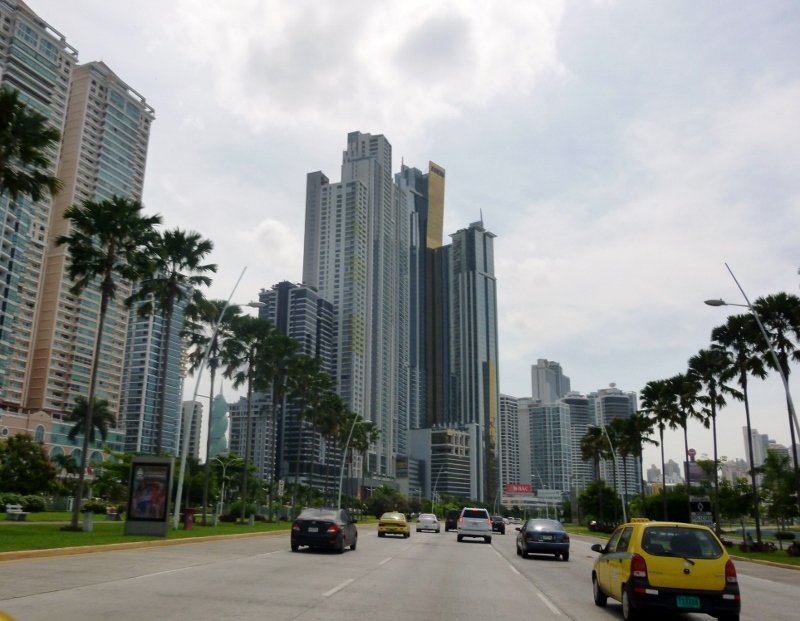 Panama City was a surprise to us as well with it’s eclectic mix of modern architecture and stylish clothing versus 16th century Spanish ruins and colonial architecture as well as a surprising amount of people wearing traditional style clothing. 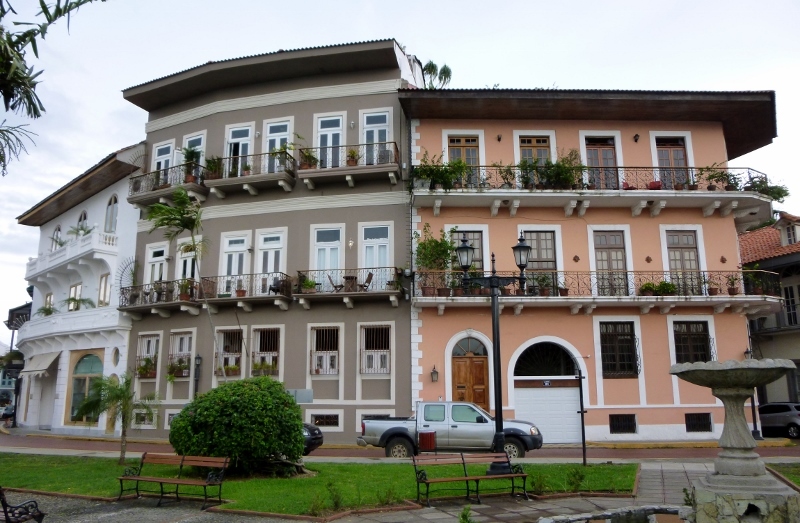 Casco Viejo looks amazing, and great photos highlighting the contrast between old and new. It sounds like Panama has a very interesting history I know little about. I hope to visit some day! Casco Viejo was beautiful and almost felt European with the magnificent restored buildings and variety of restaurants and trendy shops. Seeing the “gentrification” process was eye-opening and even had us speculating how much fun it would be to live in one of the restored apartments. It would be interesting to visit it in a few years and see this area reclaimed and cared for. Oh, how interesting! You were correct in your opening that I think Canal when I hear the word Panama and hadn’t really given the city any thought! A most interesting post and loved the photos!! When we first arrived in Panama City we too were only thinking about seeing the canal and visiting the Miraflores and Gatun Locks. However, once we started delving into the history we found out there’s so much more to the city and we ended up spending several days there exploring what it has to offer from riding the new metro to visiting the Baha’i temple and the National Festival of the Artisans. Fascinating blend of old and new. I appreciated your recap of the history of the place. It’s interesting to see the skyline of the new city act as a backdrop for the beautiful old ruins. 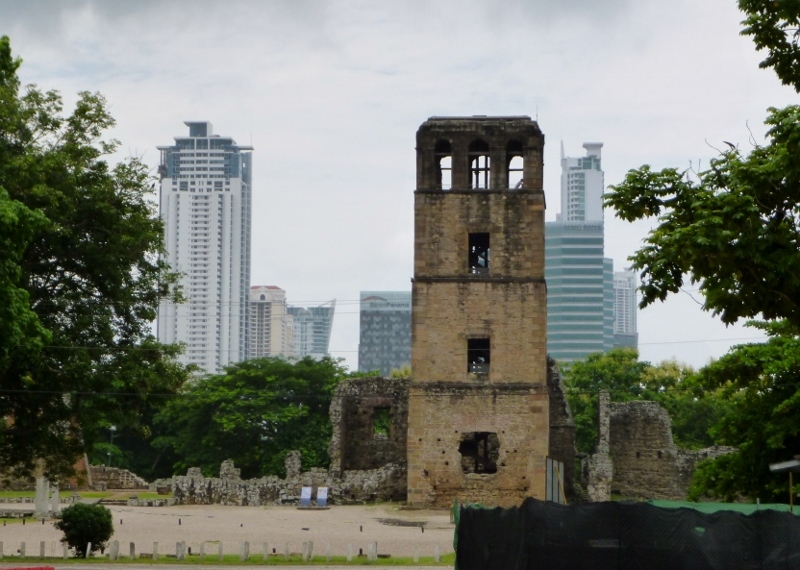 We really liked the juxtaposition of Panama Viejo’s ruins against the skyline of the contemporary Panama City. Reading about the city’s history was fascinating as well as walking around different areas sightseeing since each neighborhood was so distinctly different. Panama City is definitely worth a visit! I had no idea it looked this this! I love the old architecture! I love the beautiful modern city as well. The best of both! Panama City combines a variety of neighborhoods with the old Spanish ruins of Panama Viejo, the newer colonial architecture of Casco Viejo and the stunning skyline lined with skyscrapers. Add in modern malls and contemporary neighborhoods as well as the Panama canal and it makes for a very interesting mix as well as a place to spend several days exploring! When we cruised through the Panama Canal, I was stunned to see the skyline! We weren’t expecting the skyscrapers either and it was quite a jarring contrast to the smaller cities we’d been living in and traveling through where two and three stories are usually the highest buildings and traffic is limited to two lanes. However, it seems that Panama City’s goal is to be perceived as the banking city for Central America and it’s working hard to project the perception of a modern city! When I was a Pan Am stewardess I used to go to Panama often. That was a long time ago and I haven’t been back. Thanks for the trip down memory lane! Panama City seems to be a city embracing change and rapidly moving forward to modernize itself. At the beginning of our visit to Panama we visited and rode on the newly completed 1st route of the metro which was as modern, fast and clean as anything in the US. I’m sure you’d find a lot of changes since your last visit but the appeal to the city would remain the same. Panama Viejo looks stunning. 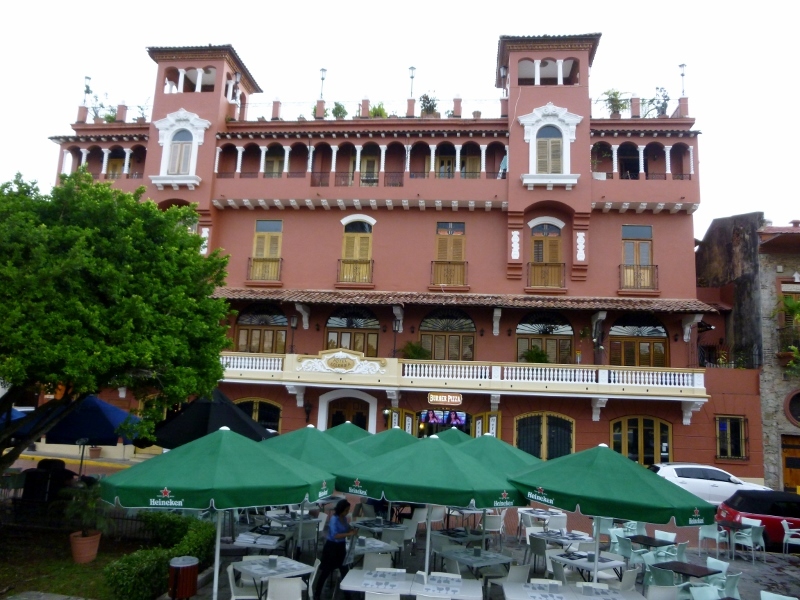 I recently watched a House Hunters International episode where a couple purchased a home in or near Casco Viejo and recall how beautiful it was. It wasn’t all that expensive either but I imagine prices are climbing along with its popularity. We loved Casco Viejo with its proximity to the bay, old churches and government buildings as well as the beautifully restored colonial buildings that had us dreaming of settling there for a spell. However, to stay in the old quarter was definitely a splurge for us and the restaurants, also were not cheap! 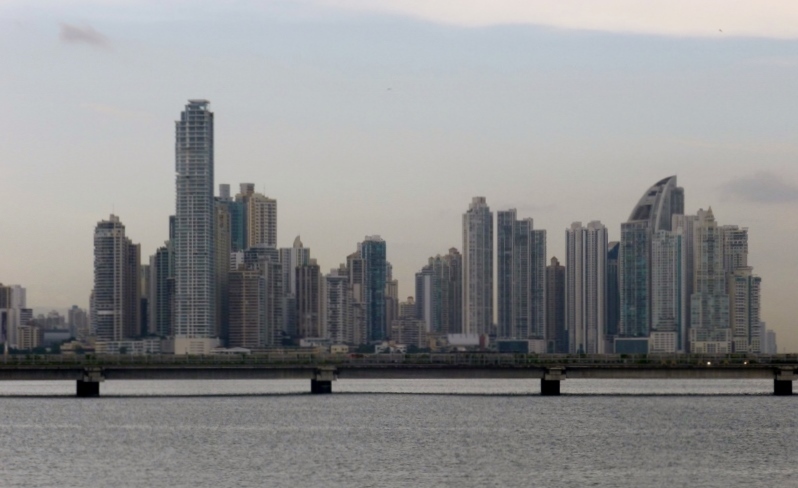 Wow, had no idea that Panama City had a skyline like that, and the history is fascinating. Thanks. The skyline is stunning and the skyscrapers line the bay as well as dot the city with their modern, contemporary structures. Definitely a bit of culture shock to travel back into a modern city compared to our time traveling through a much quieter Panama! 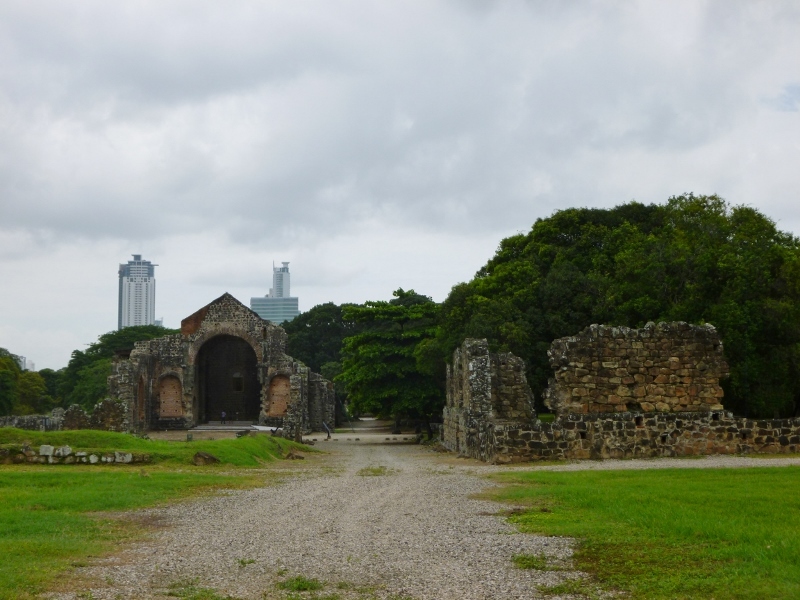 We also loved the contrast between the very modern skyscrapers and the 16th century ruins of Panama Viejo as well as the contrast between the restored buildings in Casco Viejo next to dilapidated, ghetto-style buildings. What a fascinating look at the juxtaposition of old and new. Panama Viejo is stunning, particularly the photo with the glass and steel skyscrapers in the background. You picked our favorite photo. A watchtower that was four stories high and state-of-the-art architecture back in the 16th century contrasts rather nicely to our contemporary architecture of today!